Some of us are really, really mad this week. Some are vehemently angry like Senator Graham who, earlier this week, slammed Democrats and venerated Judge Brett Kavanaugh. The Southern Senator was, to say the least, smoking hot. Dear Americans, all of us get angry when something we love is threatened, or a possible change is at play. What we are seeing is not just an issue of women’s rights (although this is certainly a part of today’s story); it’s specifically about the rights of those who have been sexually abused in the past by perpetrators who have not been held accountable by their previous actions. All other snaps, shards, bloodbaths and brutal remarks from both left and right, female and male, and those with power and position over the powerless are not central to the issue in America today, which is not whether or not Judge Kavanaugh will or will not be nominated; it is how we, as a nation and as a culture, will bring justice to those who have been sexually violated. This needs to be debated. This needs the passionate on the issue to remain passionate. Here is the question we are wrestling with: What do we do with people in positions of power who exploit those who have little or no power? Let’s go even more baseline and take power out of the argument for a moment. Here’s the rub, America. What do we do with those who have wronged another soul and dance free? THAT’S the issue. I’m not speaking for or against Democrats or Republicans. I’m not speaking for or against women or men. I am speaking FOR justice, and so should you if you’re anywhere close to listening to Jesus. And Jesus? Jesus was ALL about justice. That is why He was killed. He brought to us a Kingdom not of this earth. He pronounced a message over and over and over again how the first will be last, and how the meek will inherit the earth. The power He was about was the self-connective—and the beautifully levelling—power of love. To Jesus, it is never about more or less; it’s about the God-centered ability within us all to share, treat others respectfully and equally, and yep, here is that word Jesus engages over and over and over again, and it is love. Power hoarders hate His message and always will. Consider the Rich Young Man (Luke 18:18-30) who struggled with Jesus’ response when Jesus said what he was to do with his wealth (and perhaps power). Jesus healed those who asked for healing, and the gospels do not contain all His healing stories (John 21:25), and His words to those with clout is clear: for treasure in heaven tomorrow start sharing today. Dear Americans, and, specifically, dear Christians, find Jesus’s healing stories in your life so that, in practice, you can help heal other peoples’ stories. Like times before and times to come, it is your time to consider (or reconsider) power and abuse, and whether you want to be vocal about it or not. But know what the real issue is. It is what we are to do with love. On the subject of love, Jesus is both poignant and instructive. Love isn’t silent. Love isn’t passive. Love is action and reaction. In Mark 9:38-41, scripture we have this Sunday, Jesus’ focus is not on the one who heals in His name. His attention is on those who dispute how healing should be done, and by whom. Some may say Jesus does not directly speak to how America should continue in these days ahead in regard to Dr. Ford and Judge Kavanaugh, but I say He does. Listen to His words, embrace His essence. Let violence end by letting love win. PRAYER: Dear Jesus, why do we stop listening to You? Draw us to You not divisively, but inclusively so that Your messages of love and justice are not just known, they’re practiced. Amen. 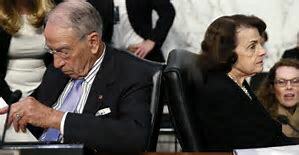 Pictured here are Senators Dianne Feinstein and Chuck Grassley at Judge Kavanaugh’s hearing on September 27, 2018.